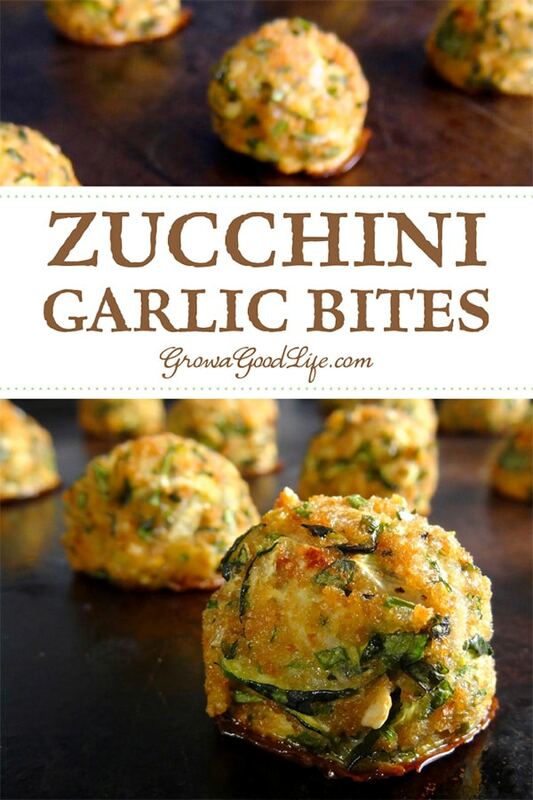 Ah, zucchini…Its the crop that just keeps on giving throughout the growing season. This recipe is one more way to transform it into a scrumptious bite that can be served as an appetizer, side dish, or even a kid’s meal. This time of year has the kitchen busy with preserving the harvest. Right now, the counters are filled with tomatoes and zucchini harvested from the garden. Both are in heavy rotation as I turn the ripe tomatoes into sauce or salsa, and the zucchini into zucchini lasagna, zucchini bread, or preserve for later. Once the counter is cleared, I have only a short moment of satisfaction before it begins filling up once again with newly picked fruit. With football season approaching, I wanted to add something different to our weekly finger food spread. Since weekends spent preserving the harvest usually stretches well into fall, it had to be something tasty but easy to throw together. Faced with a counter full of newly harvested zucchini, and the aroma of tomato sauce filling the kitchen as it simmered on the stove, it was then that I remembered one of those cooking videos on Facebook. It was some sort of shredded zucchini combination to resemble tater tots. I wanted to try something similar but with an Italian inspired twist. I began chopping up some fresh parsley, oregano, and basil. I thought about adding minced onion and garlic, but worried about the texture since they wouldn’t have time to soften. Instead, I added chopped chives for a mild onion flavor and grated the garlic that infused into the mixture. A little Parmesan cheese added a slight nutty flavor. Key to the success of this recipe is to squeeze out as much moisture as you can from the shredded zucchini. This will result in a bite that is crispy on the outside and tender on the inside. Shred your zucchini by sliding across the large holes of a box grater. 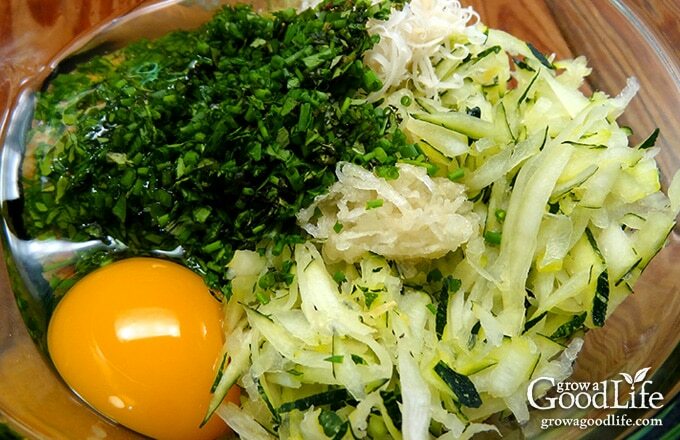 Place the grated zucchini in a clean kitchen towel and twist the towel to wring out moisture. 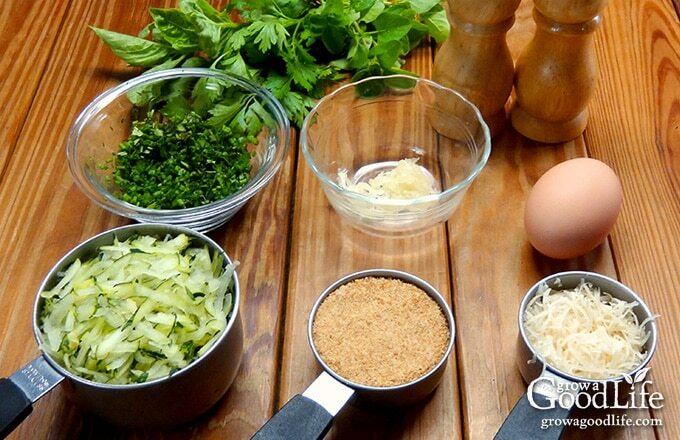 Grate the garlic using the small holes on the box grater and combine all of the ingredients in a medium bowl. 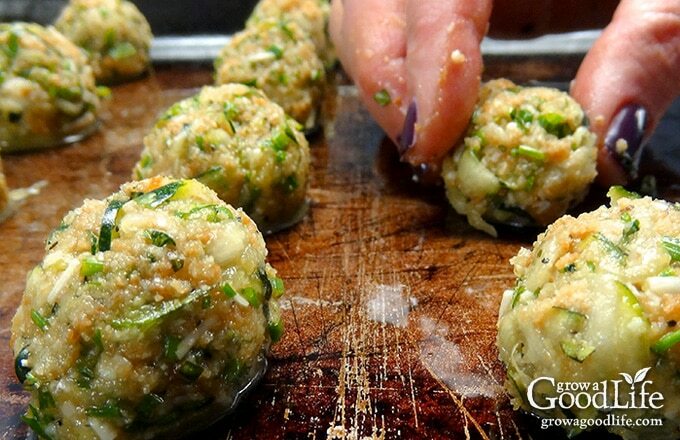 Shape the zucchini mixture into small balls, and place on your prepared baking sheets. Bake until golden and serve warm with a tomato dipping sauce. This tasty recipe combines shredded zucchini with garlic, Parmesan cheese, fresh herbs, and is served with a marinara dipping sauce for an Italian inspired twist. Preheat oven to 400˚F. Lightly coat a baking sheet with olive oil or non-stick spray. Set aside. Use a box grater to grate the zucchini into a clean towel. Roll up the towel and twist to wring out the moisture. Grate the garlic using the small holes on the box grater. 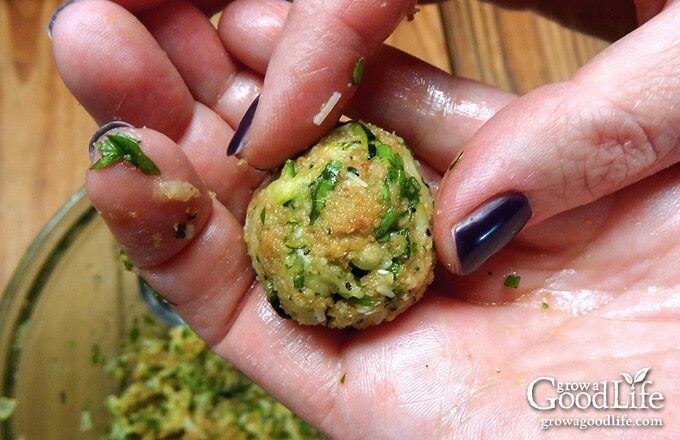 Shape a tablespoon of the mixture into your hands, pat into small balls, and place on the baking sheet. Bake for 15-18 minutes in the preheated oven until golden. Serve warm with marinara sauce. Recipe makes about 16 bites. I’m going to be making these as an appetizer on Easter. Since I’ll be in church in the morning I won’t have too much time. Would you recommend preparing them the night before and baking them the following afternoon or baking them the night before and just reheating? I want it to taste as fresh as possible. Nat, Baking the night before and re-heating in the oven would work better. I am not sure how the mixture will hold up overnight since I have not tried it. Just made some and enjoyed them. How are you storing them? I made them in my airfryer. They came out perfect and delicious. Maribel, I am so glad you liked them. Thank you for letting me know that an air fryer works. I will have to try it. These sound delicious! Could they be baked in a cake pop maker? Summertime it’s too hot to turn on the oven so I was wondering if that could work…anyone tried it? Vicki, Let me know if you try it. What a great starting point! We were in the cajun mood, so we switched out the Italian herbs for a cajun seasoning blend and used a lite ranch dressing for dipping. I did use the rest of your recipe and procedure. It worked fantastically and my family already has requested these again in a tasting event, varying the seasonings and cheeses. What a hit!! Stacia, I am so glad you liked the recipe! Yes, it is pretty versatile recipe and you can swap out the herbs and the cheese depending on the flavors you like. Thanks for your comment! I don’t know. haven’t tried deep frying. Served these little bites as an appetizer while family was waiting for homemade pizza to finish baking. They were so yummy! I’ll definitely make them again! Would dry herbs ruin this? No, it won’t ruin it. Dried herbs are more potent, so substitute about half dried for fresh. I’m not sure it will bind the ingredients in the same way. If you try it, please let me know how you make out. AMAZING!!! we didn’t even dip in anything and they were good cold, also. Husband took them to work the next day! I’m making a quadruple batch next time! Mary, I am so glad you enjoyed them! Thanks for your comment. How would these go with almond meal instead of breadcrumbs? I don’t know. Please let me know if you try it. 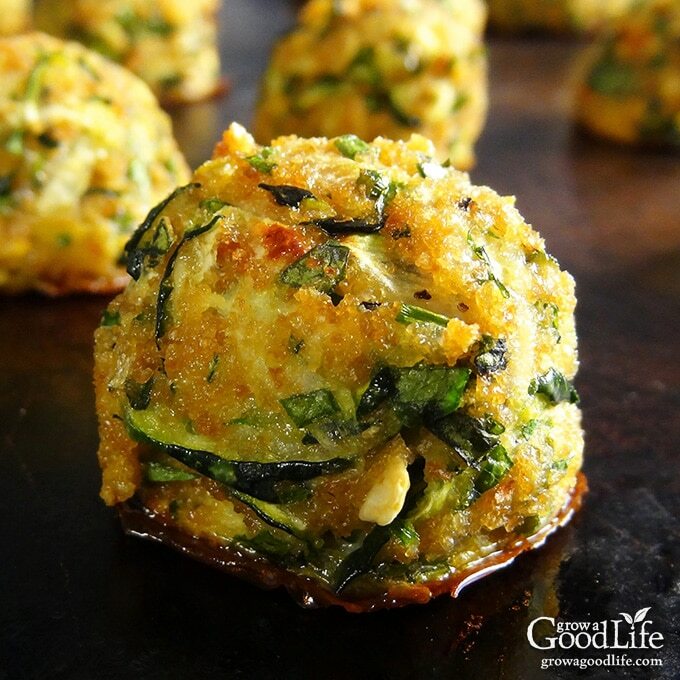 I made these with almond meal last night and they were a hit! First thing gone at the party I made them for. I played with the ratios a bit. Used about a cup and a half of zucchini, 2 eggs, a scant 2/3 c of almond meal in place of the breadcrumbs, and doubled everything else–parm, garlic, herbs, etc. Definitely baked them substantially longer than called for. Possibly double. Also did as another reviewer said and flipped them over halfway for even browning. Yum! These look delicious. How many servings does this recipe make? Karen, The recipe makes about 16 bites. I was just wondering how well these would go with spaghetti instead of meatballs, maybe subs too. Pamela, These are delicious as spaghetti and meatballs! They don’t hold up to simmering in the sauce, but we add them to the top of the pasta and pour on the sauce at meal time. 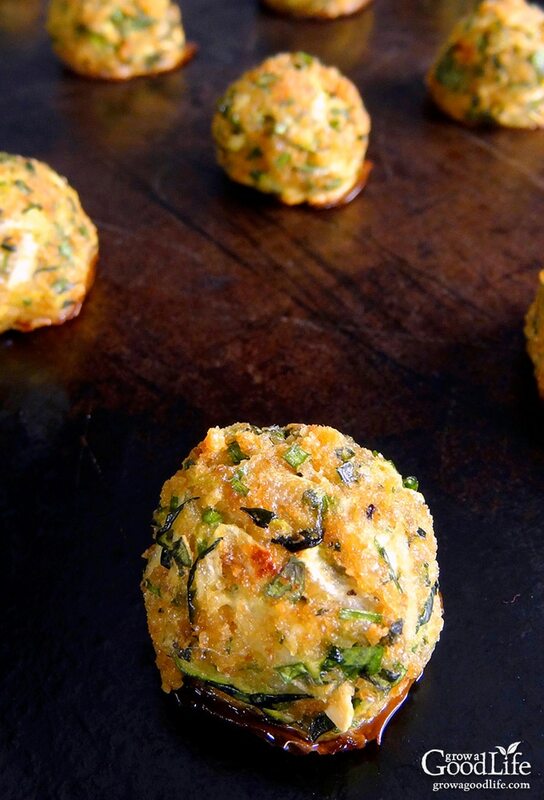 Can you bake these before hand for a large crowd and then reheat them before serving? Rachel, thank you for this recipe! how would I reheat them? I would try in a 400˚F oven for 5-10 minutes until warm. I made a double batch of these yesterday. They were a HUGE hit.. I turned them over 1/2 way through baking to accomplish a more even browning.. I used plain Panko bread crumbs. Someone asked about preparing them without the bread crumbs. I don’t think they would work very well without something to bind them. Debbie, Thank you for letting me know that the Zucchini Garlic Bites were a hit! Yes, the bread crumbs are necessary to hold the bites together. Could you freeze these before baking? Lois, I would not freeze these before baking because the zucchini will break down and be too watery, but you could try baking it first, than freezing it. I have not tried this, so please let me know how you make out if you do try it. Lois did you try freezing? Did it work? I was thinking of making them for a dinner exchange. These look delicious but I was wondering if they would work if I eliminated the bread crumbs for a low carb option? I have no idea. Let me know if you try it. Anne, The bread crumbs are what helps the zucchini garlic bite hold together in a ball. Hi, just ran across this. I used crushed pork rinds to make it keto friendly and added bacon. So yummy! I would think that they are used for a binding agent.